Ok, so I’m not really an Iron Chef, or that great of a cook, but for a few weeks now, I have been trying to plan/organize dinner for each week. I take one day each week, which is usually Saturday or Monday to find at least 3-4 recipes that sound unique yet appetizing. I think my strategy has worked great so far. Billy and I have enjoyed turkey burgers, Moroccan chicken with chickpeas and curry, steak fajita quesadillas, crispy ranch chicken, and the list goes on. 2. Print recipes on cardstock. I get 4 recipes on 1 sheet of 8.5 X 11, and then cut in quarters for easy handling. 3. Make a grocery list with all necessary ingredients. 4. Write the weekly menu on a dry erase board or chalkboard. This really helps you know what you have bought so that all that food doesn’t go to waste. And it also allows for flexibility if you need to change things around… just because you write Chicken Parmesan for Monday doesn’t mean that you can’t move it to Friday! 5. Cook your delicious recipes and ENJOY! Please share your cooking / recipe secrets with us! What works for you? What doesn’t work for you? 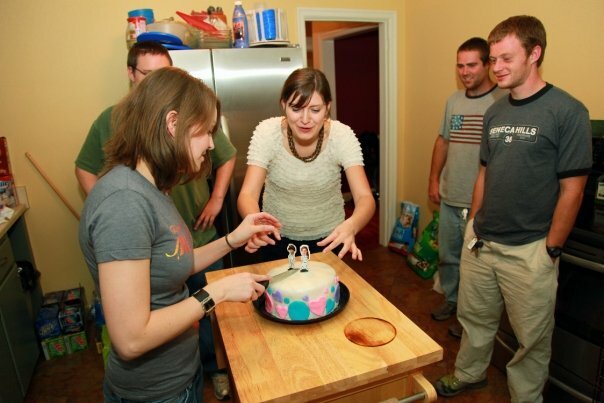 Our first attempt at making a cake covered in fondant. It turned out pretty good... thanks to Billy! I laid down for a short nap... more like 3 1/2 hours, and when I woke up this is what I saw. I'm so impressed with my man's pastry skills! 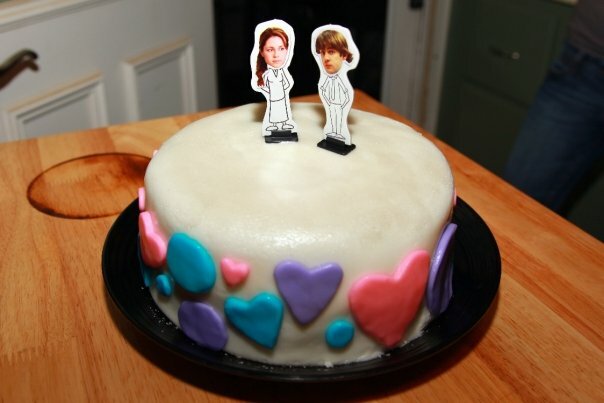 Jim and Pam got married on The Office this past week... hence the cake topper. Our friends came over to celebrate! 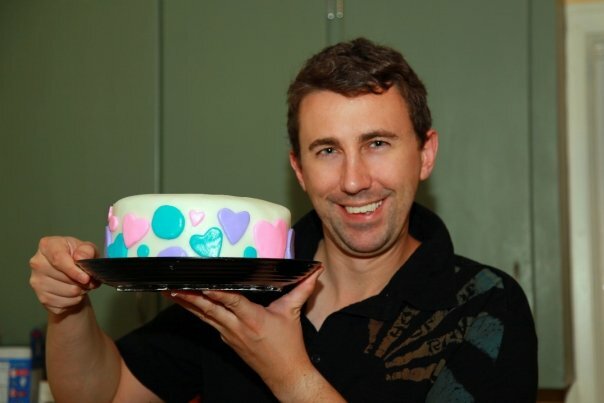 If I haven’t said it before I love baking! 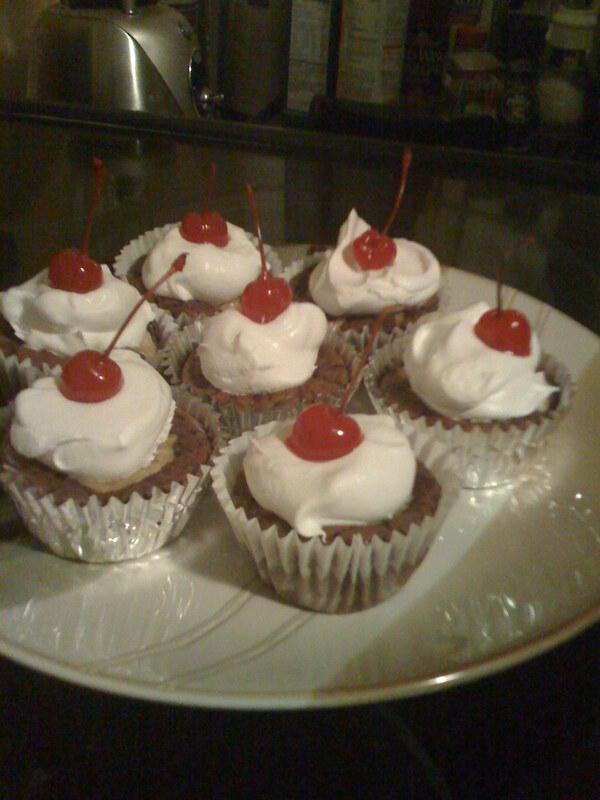 The other night my cousin and I made these delicious Smores Cupcakes. They turned out moist and delicious. 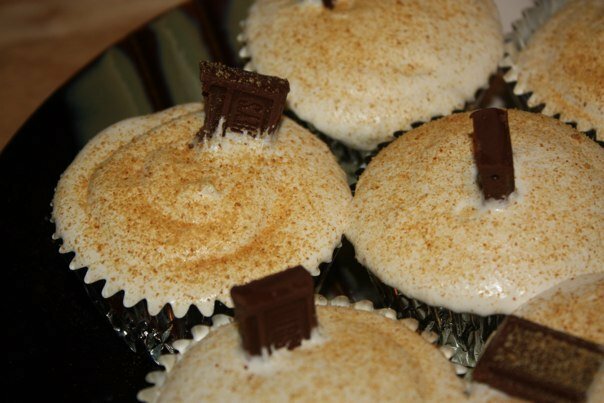 The tops are dusted with graham cracker crumbs, and each cupcake is topped with a square of Hershey’s chocolate. Last night was The Office season premiere so we had our friends over for the big debut. The highlight of the night for me was introducing everyone to my new creation. It’s a cross between a quesadilla and grilled cheese sandwich. I call them Mexigrills. They were a big hit and so simple to make which is what I’m all about. 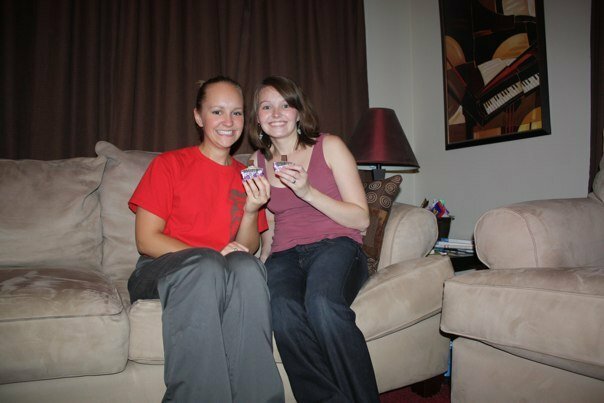 Our friends loved the recipe so much that we had a cooking lesson before watching The Office. It was so much fun! Okay, so it’s not true Mexican, but it’s a quick appetizer that your friends, kids, and family can help make. On top of the stove on low to medium heat, heat butter and salt to give pan a nice coating. Then place your tortilla flat in the pan. Next place cheese (as much as you like) on top of the tortilla, then fold in half. Cook until it is to a crispy golden brown. Half into 2 triangular shapes. Last, but not least…ENJOY! 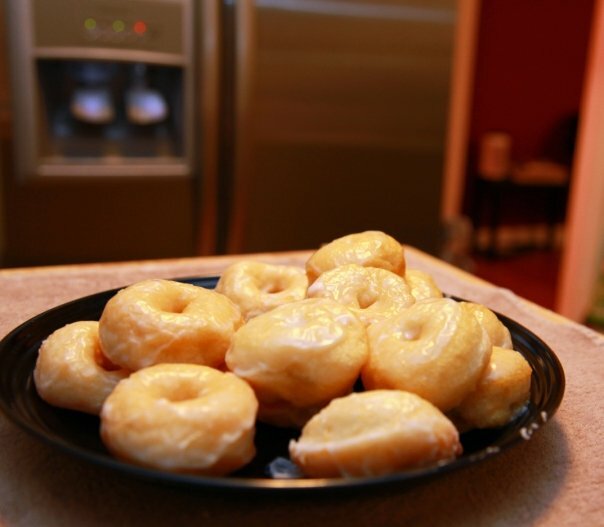 In honor of National Donut Day, which falls on the first Friday of June every year, we tried our hand at homemade donuts. 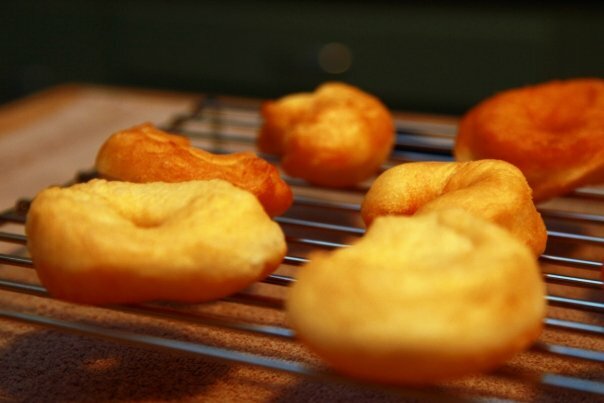 We used biscuit dough for the batter, pierced the center to make it look like a donut, and then deep fried them. I made a homemade glaze (warm a 1/4 cup of milk and vanilla on stove. remove from heat. slowly add in 2 cups of powdered sugar to milk and vanilla.) which was sugary goodness! Our donuts are no Krispy Kreme, but it was fun making them as a family. Baking is one of my favorite things. I don’t do it as often as I’d like, but tonight I got to bake with my cousin Rachel. Great company and yummy recipes equal good times! 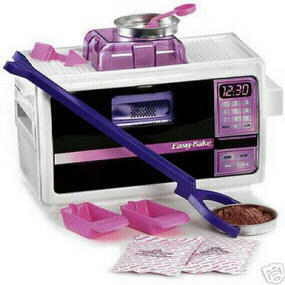 This was nothing like my Easy Bake Oven baking experience that I talked about in my previous post! Click here to find out how to make these Peanut Butter Cheesecake Brownie Babies!